This week has been split between some upcoming feature work (infiniband and clustering), helping some new contributors get started with contributing to LXD and doing a lot of backports to the stable branches. Our stable branch backlog is now empty on all 3 projects and @brauner is now handling this for LXC with @stgraber handling the stable branches of LXD and LXCFS. Following the PPA deprecation warning we issued last week, we’ve also been busy with dealing with a number of issues related to the snap package as more users upgrade to it. On the LXC side of things, we got quite a few contributions to various part of the code, which we’ve reviewed and merged. Added support for overriding the LXD executable path1 as needed for smooth snap upgrades. Fixed the GPU passthrough code to support NVidia devices without the nvidia driver. Fixed a couple of problems in the autocompletion profile. Fixed lxc_init to set the control terminal for subprocesses. Fixed lxc-test-unpriv to only delete the test user if it exists. Updated our documentation to cover lxc.namespace. Made some improvements to the lxc-oci template, adding support for unprivileged mode, writing /etc/hostname and /etc/hosts and more. Fixed a typo in the RPM spec file. Moved some libcap definitions over to utils.h. 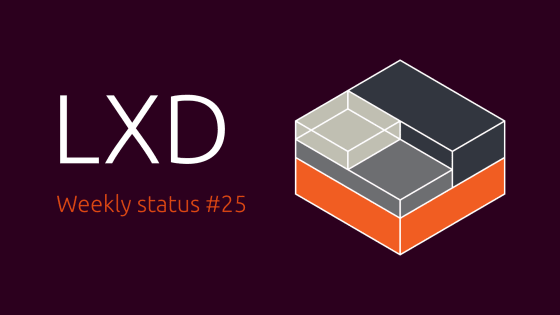 Updated LXD 2.0.11 in xenial-proposed with a couple of bugfixes (2.0.11-0ubuntu1~16.04.2). Fixed a number of runtime warnings related to os-release. Included some required ebtables modules. Updated a number of scripts to use /snap/lxd/current rather than the versioned path, fixing a number of issues on upgrade. Fixed cgroup handling for systems that have cgroupv2.